JJ's Bespoke Joinery builds custom curved, spiral and circular stairways for residential and commercial sites throughout Ireland and the UK, with many of our contracts in Belfast, Edinburgh & London City. Our designer wood stairways are used by interior designers, architects and builders to complement that new construction and remodel designs for Modern, Colonial, Victorian, Traditional, Mediterranean and Prairie Homes as well as Offices. We work closely with the architect, interior designer, builder and homeowner to design and build the perfect custom curved, spiral or circular staircase. We use the best materials in glass, wood and metal to create stairways, stair railings and spindles that fit your design, budget and building codes. 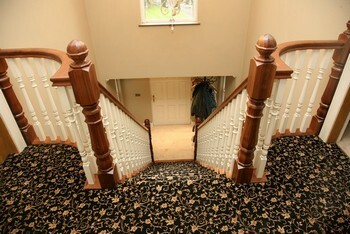 For reconstruction, remodels or historic renovation, JJ's has the perfect staircase and finish for you. JJ's make it easy to design curved stairs, spiral staircases and circular stairways using CAD drawing programs. 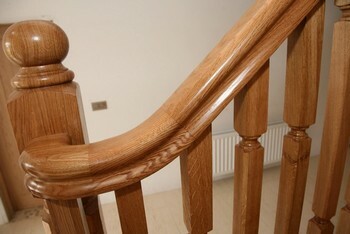 Choosing a flared stair and bowed treads can make all the difference when deciding between a classic or modern finishing touch, whether carving every tread or just one, the possibilities are endless. Each tread is colour-matched providing the same aesthetically pleasing look as the string. JJ's meets both the structural and aesthetic specification for a wide range of installations. Freestanding, wall supported curved or straight staircases are readily available with custom components, materials, profiles, custom spindles, stone treads, risers and metal or glass spindles. 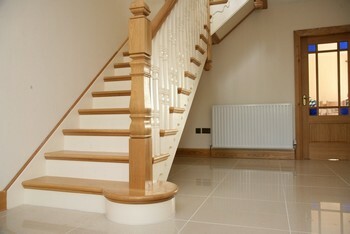 Click here to view our Stairs portfolio.